HMD has launched the Nokia 7 as a mid-range smartphone, and at the highest position is currently occupied by Nokia 8 which brings Snapdragon 835 chipset. 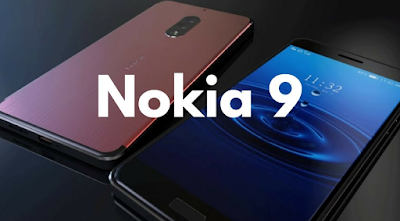 However, Nokia fans are still waiting for the presence of other flagship smartphones are expected to be Nokia 9. Many rumors that arise about smartphones , one of which says if the launch will take place before the turn of 2018. While there are other sources who claim if Nokia 9 will be launched at the Mobile World Congress (MWC) 2018 which is scheduled to take place in February 2018. Now leaked rendering of the Nokia 9 Edge smartphone has emerged that displays the design of the device. When viewed, the amazing design of the Nokia 9 Edge is able to defeat the design of the Galaxy Note 8. The device comes with a curved panel panel of 5.5 inches wide and of course with a full-screen design. The back of the phone is equipped with a pair of 16 megapixel sensors are arranged vertically along with dual LED flash. Interesting feature that can be seen on the rear panel of Nokia 9 Edge is the existence of an infrared projector capable of mimicking the screen display. For the fingerprint scanner sensor is on the back of the smartphone and visible also the health sensor. This device is also equipped with an 8MP resolution selfie camera. Unfortunately there is no information about the hardware carried by this device. Nokia 9 is said to be present in two models. The basic model has 6 GB of RAM and 64 GB of storage, while for the higher model has 8 GB of RAM and 128 GB of storage. But according to previous rumors, HMD will design Nokia 9 with a design based on Nokia 8 and will have a slimmer bezel and a larger screen. To see more details, you can see it in the video below.